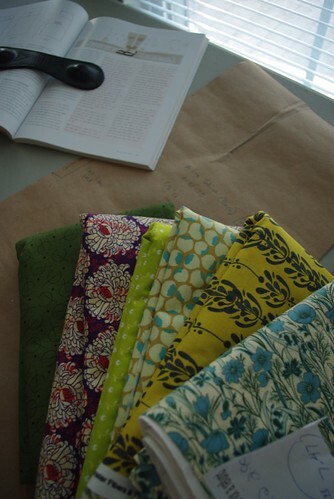 As I mentioned before, one of my 2010 goals is to make more time for sewing. Part of the reason for my renewed enthusiasm is that my friend Maggie just started sewing and there is nothing more contagious than the enthusiasm of a new sewer. The green on the bottom I hope to make into the Ceylon pattern from Collette Patterns. Some kind of dress, but I'm sure yet- any suggestions are welcome! The next two pieces will likely be tops of some sort. The flowered piece on the top I'd like to make into a version of this top.